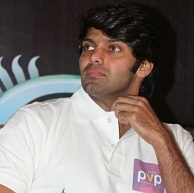 Arya will begin shooting for his next with director Magizh Thirumeni, from December 5th onwards in Chennai. Pandianadu fame Harish is also cast in this movie in a pivotal role. The movie is supposed to be an action thriller with Arya believed to be playing a cop's role. The heroine hunt for this film is still going on. Sathish Kumar will be handling the camera for this untitled film, and he is currently also working in Jayam Ravi's Boologam and the Hindi movie Desi Kattey, directed by Anand Kumar. Arya meanwhile, is riding a hot streak with back to back hits, in the form of Raja Rani and Arrambam, and he is keeping his fingers crossed on his biggest movie till date Irandam Ulagam, releasing this Friday. People looking for online information on Arya, Irandam Ulagam, Magizh Thirumeni will find this news story useful.